Jasminum Linn., Sp. Pl. 7. 1753. Gen. Pl. ed. 5: 7. 1754; C.B. Clarke in Hook. f., Fl. Brit. Ind. 3: 591. 1882; Parker, For. Fl. Punj. ed. 3. 314. 1956. Shrubs, climbing, twining, or erect. Leaves opposite, or alternate, simple or imparipinnate. Flowers attractive, frequently fragrant, cymes tri-or dichotomous, simple, or flowers solitary. Calyx 4-9-fid, teeth linear, long or short, or almost truncate. Corolla 1 cm in diameter or more, salver-shaped, white or yellow, tube narrow; lobes (4-)5-9(-10), patent, imbricate in bud. Flowers often heterostylous. Berry didymous or simple (by abortion); each part globose, ellipsoid or elongated, containing 1-2 seeds; cultivated species frequently without berries. Species c. 300, distributed mainly in tropical and subtropical Eurasia, Africa, Pacific. 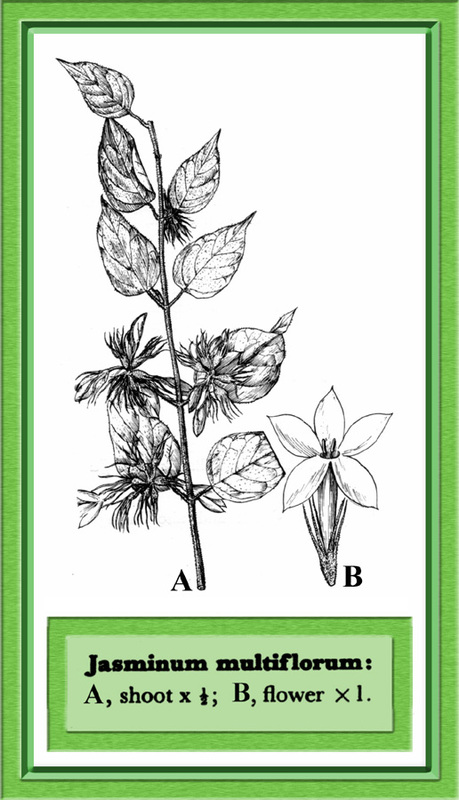 Representeh by 14 wild or cultivated species in Pakistan.